Death Star technology may be more real than you think. Defense contractor Raytheon, in partnership with the U.S. Army, announced last week the successful testing of an in-sky laser weapon. 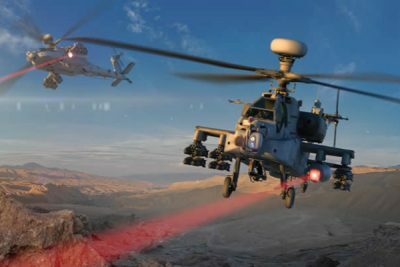 The test featured a fully-integrated laser system attached to an Apache AH-64, which shot at a stationary target from a distance of 1.4 km. in White Sands, NM. The test was notable not only for successful laser targeting and beam control, but for its use of a rotary-wing aircraft. Furthermore, unlike video game or Star Wars portrayals of laser technology, the laser emitted in the recent test was silent and invisible to the naked eye. “By combining combat proven sensors… we can bring this capability to the battlefield sooner rather than later,” said Art Morrish, vice president of Advanced Concept and Technologies for Raytheon Space and Airborne Systems. The U.S. military has used lasers in non-weapon applications for a long time, but the debut of a laser weapon on the battlefield may be close at hand, and the global powers are in a race to develop the best and brightest. Just last month, emerging laser technology was the subject of a presentation at the Pentagon. Matthew Ketner, branch chief of the High Energy Laser Controls and Integration Directorate at the Naval Surface Warfare Center Dahlgren Division, Virginia, specifically noted that the February tests in White Sands used lasers to shoot down unmanned aerial vehicles (UAV’s). According to the Army News Service, the Army believes that high-energy laser weapons offer great potential as defenses against rockets, cruise missiles, and UAV’s, in addition to far superior accuracy than traditional artillery. In March, Lockheed Martin also announced that it had completed development of a 60 Kilowatt laser weapon meant for deployment on tactical vehicles. Naturally, the U.S. doesn’t stand alone in its pursuit of next-generation weaponry. According to the Independent, Russia’s deputy defense minister announced in January that the Kremlin would fund research on lasers, electromagnetic, and hypersonic weaponry. Meanwhile, Britain’s Ministry of Defense has also greenlit the development of a laser weapon. China has been focused on laser technologies for years. National Interest reported in April that China sees laser weapons as a key tool for potentially wiping out U.S. space satellites. Notably, congressional testimony in 2015 from an expert on Asian affairs revealed that China’s space program is fundamentally connected to its military’s development of next-generation technology, focusing in part on laser weapons. Japan and Israel also have allocated funding for the development. Wonder how big the power supply is that powers the LASERS. Nobody really thought that all the research and development that went into the SDI project was just abandoned, did they?